Arunachal, Nagaland have Tourist Police; when Assam, Meghalaya to follow? In order to assist the tourists during their visit in Nagaland and Arunachal Pradesh, tourist police has been launched in these two northeastern States last month. But even after announcement of setting up six tourist police stations in Assam, no step has been taken by the Government till date. Besides, the Meghalaya Government and the Government of other northeastern States have also not taken any step to launch tourist police in their respective States. Aimed at promoting untapped tourism opportunities in Arunachal Pradesh, Arunchal Chief Minister Pema Khandu on November 2, 2018 launched tourist police spreading across seven different districts of the State. Arunachal became the first northeastern State to launch tourist police in the Northeast and 15th overall in the country. After Arunachal Pradesh, tourist police was launched in Nagaland on November 17, 2018 by Nagaland Police in association with the Nagaland Tourism Department. This special squad will ensure safety of tourists, both domestic and foreign, visiting the State. 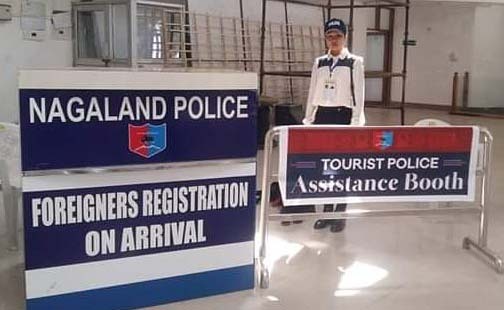 A Tourist Police Assistance Booth has also been set up in the Dimapur Airport in order to assist the tourists, both domestic and foreign so that they can tour the State without any fear. It may be mentioned that Assam Finance Minister Himanta Biswa Sarma in his budget speech in March this year said six tourist police stations would be set up in Guwahati and five national parks, including Kaziranga, to enhance the security of tourists visiting these places. However, no such police station has been set up in Assam so far. Now, after the launch of tourist police in Arunachal Pradesh and Nagaland, people of Assam, Meghalaya and other States of the Northeast have raised question, when tourist police will come up in their respective States.